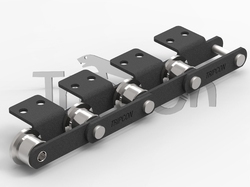 Our range of products include slat chain, slat conveyor chain and stainless steel slat conveyor chain. 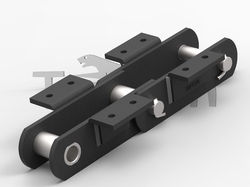 We bring forth an impeccable array of excellent quality Slat Chain to the esteemed clients. These offered chains are perfectly designed and manufactured using optimum quality raw material and advanced tools and technology that is procured from some of the most credible vendors of the market. In order to meet the demands, we make available these panels in a variety of sizes and grades as per the client's needs and requirements. 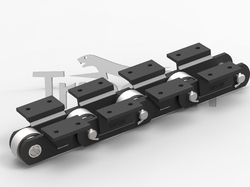 We offer a premier Slat Conveyor Chain, which are available in wide choice of configurations. Our products are extensively used for Transporting Tote Boxes & Pallets and Transporting Bulk Material or load, which are featured with one or more endless Chain(s) on which loads are carried. To manufacture this offered range our professionals make use of qualitative raw material. Looking for Slat Chains ?